Shopping on the internet, storing photos in the cloud, turning up a thermostat with an app—all are commonplace. 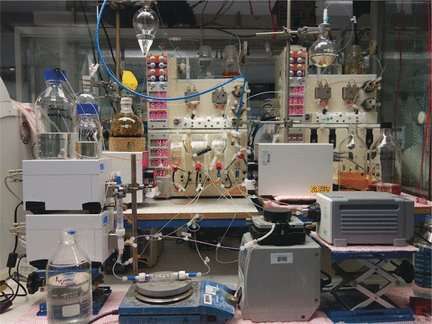 Now, the internet of things and the cloud are entering the world of chemical research and production, as reported in the journal Angewandte Chemie. Researchers have used remote servers in Japan to autonomously optimize conditions to synthesize drugs in a British laboratory. The process was controlled over the internet by researchers in the USA. Modern production processes cannot simply assemble a target molecule; they have to be economical, efficient, robust, and sustainable too. It is thus necessary to develop a variety of alternative synthetic routes, design tailored equipment, and find optimal processing parameters. This is impossible without a deep understanding of the reactions taking place and a vast amount of data collected under different conditions. In the areas of natural products synthesis and pharmaceuticals, the trend is toward automation of repeated reaction sequences and self-optimizing processes. These are based on machine learning and information feedback in the form of measurements obtained from observation of reactions. Researchers led by Steven V. Ley at the University of Cambridge (UK) and California State University Fullerton (USA) have now demonstrated that this approach can succeed across international borders and time zones—by use of the cloud. Remote servers in Tokyo (Japan) autonomously developed optimal synthetic conditions for three pharmaceutical agents that were physically synthesized in laboratories in Cambridge (UK). The process was initiated, controlled, and monitored by researchers in Los Angeles (USA) over an internet connection. In this way it was possible for the machines to self optimize the individual synthetic steps for tramadol, lidocaine, and bupropion as representative sample substances, with minimal intervention by the operators over hours. In the case of tramadol, three parameters were varied: temperature, residence time, and the ratio of reactants. Guided by spectroscopic data, the control system carried out nine fully autonomous experiments over a period of three hours and identified optimized conditions for a maximized conversion with the highest possible throughput and little consumption of the starting materials. The autonomous character of this cloud-based approach makes specialized knowledge and equipment broadly available and uses these resources efficiently by avoiding redundancies and allowing for global collaborations in which distance is irrelevant.